Back in May we looked at the AMD Radeon HD 4290 integrated graphics Linux performance of the 890GX motherboard chipset found on the MSI 890GXM-G65 and many other motherboards. This ATI Radeon 4290 (890GX) wasn't the most compelling integrated graphics processor we found with its OpenGL performance using the proprietary Catalyst driver being significantly lower than even the cheapest PCI Express graphics cards. X-Video Bitstream Acceleration, the method whereby AMD exposes their UVD2 engine capabilities on Linux, was also rather useless (and to this day still is the case) that makes this an ineffective Linux Home Theater PC too. Since the launch of the 890GX chipset, AMD rolled out the 880G chipset as a less-expensive solution for motherboard vendors and offers a stripped-down graphics processor of what is found in the 890GX and is branded as the ATI Radeon HD 4250. Today we have a few benchmarks of the Radeon HD 4250 (880G) under Linux for your viewing pleasure. For this testing we used an AMD Athlon II X3 425 triple-core processor, 4GB of DDR3 system memory, a 250GB Seagate ST3250310AS SATA HDD, and a Dell S2409W display. The motherboards used for testing was the previously-reviewed MSI 890GXM-G65 for the Radeon HD 4290 testing and then for the 880G-based motherboard was an ASRock 880G Extreme 3. The Radeon HD 4250 graphics processor is clocked at 560MHz while the HD 4290 is running at 700MHz. The 890GX also supports Hybrid CrossFire where as the 880G does not, but besides that the features between these two chipsets are quite similar. A review on this very nice ASRock motherboard will be published in the coming days. For reference, we also tossed in an ATI Radeon HD 4670 discrete graphics card, while a comparison to other discrete AMD solutions can be found in our earlier testing. On the software side, we were running Ubuntu 10.04 LTS x86_64 with the Linux 2.6.32 kernel, GNOME 2.30.0, X.Org Server 1.7.6, the Catalyst 10.6 driver, and an EXT4 file-system. The OpenGL tests of the ATI Radeon HD 4250/4290 IGPs were done by the Phoronix Test Suite with Nexuiz, OpenArena, Warsow, VDrift, World of Padman, Unigine Sanctuary, and Enemy Territory: Quake Wars. 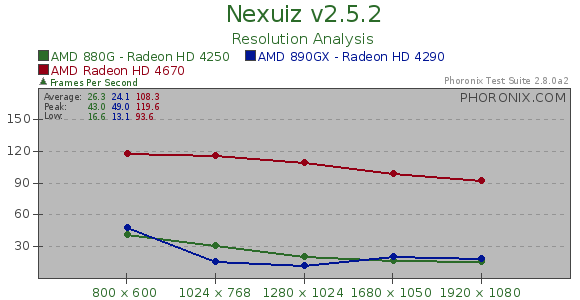 From our first test with Nexuiz, we see there is not too much of a performance difference between the Radeon HD 4250 (880G) and Radeon HD 4290 (890GX) IGPs. The 890GX performed rather poorly at 1024 x 768 and 1280 x 1024 compared to the 880G, but at 1920 x 1080 their frame-rates were close to the same.